Wholesale Candles Forget-Me-Not Candle Co.
Did Dreamers Candles going out of business catch you off guard? Click here for a reassuring note from a reliable candle company. Buy wholesale candles factory direct and save! FMNCC cater's to wholesale dealers through offering our exclusive line of candles wholesale. FMNCC offer's drop shipping for the wholesale dealer who can't store stock. Sell Forget-Me-Not Candles on your web site and have us drop ship your orders, never having to touch the product. Talk about a great work from home opportunity! FMNCC has a fundraiser section for those interested in raising money for groups such as churches, schools, cheerleading and many other fundraising needs. FMNCC offer's online shopping for the general public through our retail store for gift giving needs such as birthday gifts, wedding gifts, holiday gifts, Mothers Day gifts, Christmas gifts, gift basket fillers or just to treat yourself. Our triple scented candles thrive to be the essence of elegance. Experience the luxury of pure heaven in a jar. Forget-Me-Not Candle Co.'s jars, labels, colors and scents will reflect a special candle designed especially for gift giving. We take great pride in hand pouring each candle individually. Our candles are designed for the true candle enthusiast who expects only the best performance a candle can give. Each candle will burn evenly across the candle jar creating a wonderful burn pool which leaves no waste or tunneling affect. FMNCC is providing you with the best wax formulation resulting in extremely long burn hours and glorious scent throw which will travel throughout your entire home or office. FMNCC offer's year around **Free** gift wrapping which includes a personalized gift card created just for your special occasion. Please consider us for all your gift giving events. 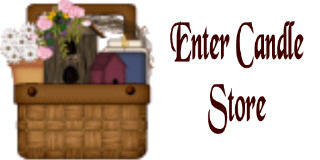 Just enter instructions in the comments section on the retail and/or specials of the month order form. FMNCC is proud to be a Texas Candle Company owned and operated by native Texans! Average test burn time of the 20oz. 2 wick candle on the left is 120 hours. The 11-oz. size candle picture on the right also has 2 wicks and has a approximate burn time of 80 hours. Forget-Me-Not Candle Company is hand pouring 2 size glass jars. We are very proud to introduce a 11-oz. Country Comfort jar with a silver tin lid. The 11-oz. 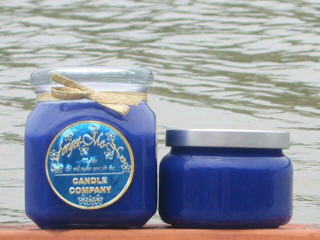 size jar carries our blue foil label with gold embossed raised letter accents on top of the lid. We are offering a 20-oz. glass Emma jar with a flat accent style lid. Our 20-oz. jar also features a blue label with gold embossed raised letter accents. Forget-Me-Not Candle Co. can reassure you that originality and uniqueness plays a great roll in our scent choices. We have a nice selection of favorite popular scents and also a wonderful selection of unusual hard to find fragrances as well. We are selling to the public off of our online candle store, we have a special of the month page, wholesale section and order form as well as fundraiser opportunities. Please sign up below for our newsletter. We offer exclusive sales available to newsletter members only. Learn about our monthly specials a few days in advance. Monday - Friday 9:00am till 4:00pm Central Standard Time. If after business hours or weekends, please email any questions for fastest response. Forget-Me-Not Candle Company and are protected by the copyright laws of the United States of America, and the Internet Copyright Act.